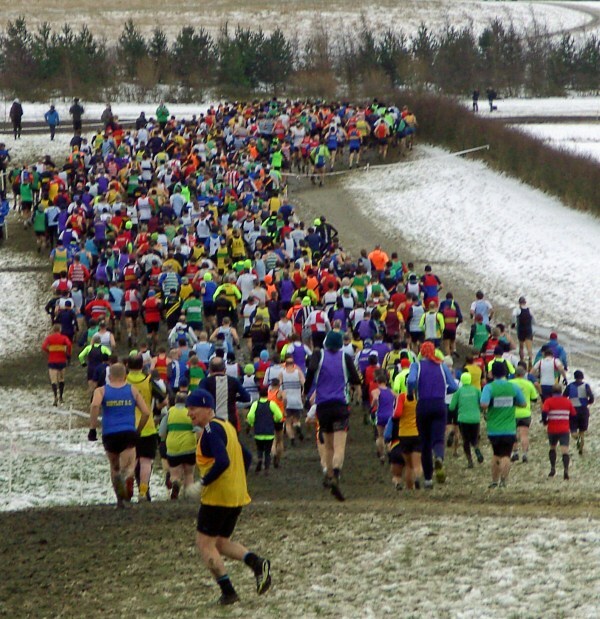 Probably the Toughest Cross Country Race in the World?! The day started with fears that the whole event would be called off because of the heavy snow that fell over night and in the morning. But that wasn't to be and we arrived at a snowy venue with the course still largely covered in the white stuff. Adam's u/17s race was first up and the mud claimed its first victim - one of Adam's shoes! He managed to find it and put it back on but lost a bit of time although still finishing well in the highly competitive field. There was a gap of nearly two hours before the senior women's race and the covering of white gradually turned into a covering of brown as more and more people began to arrive and trample the snow underfoot. The tent proved a welcome haven from the elements as more and more Striders assembled and, in spite of a degree of overcrowding, the 'tentless' Crook runners were invited to share our space. 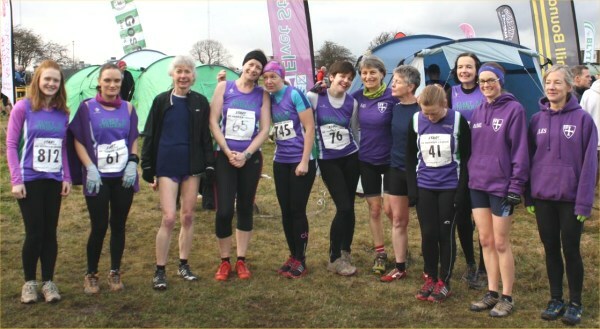 A huge wave of women runners set off on their race and included 15 Striders, two of whom were making their x/c debuts - Greta Jones & Joanne Richardson both of whom ran with great determination. Fiona led the team home but every single one of the Purple Tide made a super human effort on that course - well done everyone! It was good to see Debs back in the fold and Barbara seems to improve with every race. It was great that everyone got round in one piece and Striders had one of the biggest teams on the day. The senior men's field of over 1,000 runners assembled for the final race and it was good to hear the old 'Shipman Roar' once again as we all stood eager for the off. As the field was forced into a narrow section after the first 400m it was like running in a football crowd but things did begin to 'thin out' as the race progressed. There were hills on the course, unsurprisingly, but the mud was the biggest challenge. It covered the whole course - not just certain sections - but the whole bl##dy thing! And it was deep! Too deep to obtain any real speed on the downhill sections and too deep to be able to develop any sort of rhythm as you ran . So well done to those making their debuts; including Tom Spurling who had a cracking race, David Brown who made it round unscathed and to Mike Elliott who bravely fought on for two laps - well done! And well done to all the 21 men who set off and were led home by Will - you should all be proud of your achievement(Brian and Alan particularly)! 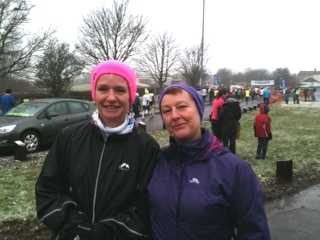 Well done too to all the Striders who spectated (Jacquie, Stan, Nigel, Simon, Louise & Mandy)- at least we could run to keep warm! So the Nationals are over for another year. They are always tough - you would expect that in a National Championship - but some are tougher than others and this year really took the biscuit for toughness - real 'hard tack'! What a contrast to last year when some of us got slightly sunburnt on Hampstead Heath! We look forward to seeing you all for another dose next year, where ever it is and whatever the conditions - it couldn't be as bad as this year - could it? 1085 finishers. Men's Team 58th of 79 (6 to count), 35th of 37 (9 to count). 427 finishers. Women's Team 32nd of 46. I'd completely forgotten I'd entered this race until a brown envelope appeared on my doormat a few days before. In fact, I'd convinced myself I hadn't entered - on checking my emails, saw no trace of a 2013 entry - but did discover I'd entered in 2012 and forgotten about that one, too. I'm pleased to see I'm consistent in my disorganisation. So, I found myself in the picturesque market town of Pocklington, on a crisp, bright, Sunday morning. I have the incredible fortune to have lovely friends who live in the village - oddly enough, just around the corner from Rachel B - so the start line saw me well rested and fed, with a perfectly delectable 5 minute walk from their house to Race HQ. And with aforementioned lovely friend carrying back my Striders hoodie - which I did debate hanging on to cos' it was flippin' freezing - I was all set and ready to go. We gathered next to the playing field, caught up with fellow Striders, and were soon ushered, en masse, a few minutes up the road to the start line. The route is superb. From the outset it's fast, flat and scenic - Pocklington is pretty enough, but Bishop Wilton and an assortment of charming, country villages inspired some serious house envy in me. Quiet roads, country lanes, some main road sections towards the end but I was largely oblivious to traffic by then and enjoying seeing whether I could maintain my pace. There's a cheeky little hill between miles 7 and 8, which Rachel had warned me about (it's not steep, but long) which flattens out after a bit before rising again ahead of the straight mile or two back into Pocklington. I could see the clock tower ahead in the distance, and it was reassuring to push through the last mile with an end point in sight. I swear Alister's rousing cheers speed me up by ten seconds every time - in fact, when I race and he's not there I mentally hear his dulcet tones shouting me home - and there I was, around the corner with a strong, comfortable finish. A fabulous route, fast course, well marshalled, great atmosphere and rolling scenery. What's not to love? I'll be back again next year, and so should you. This is my fourth time for this event. The reasons I keep returning are the friendly runners, locals and organisers and the variety of routes. The race starts and ends at the same place and uses some of the same checkpoints, but the organisers seem to be able to vary the direction and routes between the checkpoints. We drove down the day before and took the opportunity to look round Lincoln. Melanie had only visited it years ago and I had never been. I liked it, especially the area around the castle and cathedral. It was a cold day though and it was hard to spend too long outdoors. Last Sunday on the Hardmoors Osmotherley marathon I had a bit of a cold. I also took quite a bit of skin off my heels. The cold seemed to be coming back on Friday and my heels were still a bit raw. I seriously wondered whether I could do Belvoir, but the plan was to strap up my heels with several layers and to see how my cold was on Saturday morning. Saturday morning dawned, I strapped up my heels and they seemed to be okay. My cold also seemed a bit better. The run also had a option of a 15m alternative and the separation point was about 5m into the race so I thought that would give me the option of a bail out if I didn't feel good. The race organisers encouraged the runners to get to the front of the start line this year - a very welcome development as it can be a bit frustrating trying to get round walkers at the start. Soon after the start we had the first stretch of mud and this was an indication of some of what was to come. But we were lucky, some parts which could have been muddy were frozen. But it was a mixed bag, some were frozen, some not. Just before the end we reached a genuinely large mud pool and there was no alternative but to go straight through it. Melanie went first (she never used to like mud, how things have changed in the last year !) to cries of 'Eugh' from several 15m walkers who were watching and contemplating which way to go. Melanie had an slightly eventful race, she slipped early on (no damage) and later had her hat taken off by a bush that reached out and grabbed it . When we reached the separation point of the 26m and 15m option I was feeling pretty good. The padding on my heels seemed to be working, my cold seemed much better. We were both feeling tired though as our legs had not recovered from the races last Sunday. But that wasn't sufficient reason to do the 15m. The route undulated around and across fields, through attractive villages and every 5m or so there was a checkpoint with plenty of home made food (but no pizza this year). At about 19m we went close to the lovely Belvoir Castle. At about 21m it started to snow, but it felt that we were almost back by then. I was pretty tired at this point and the run walk strategy we were employing was helping Melanie's ITB which had been giving her some concern since the 14m point. We got back to the Village Hall to the soup followed by bread and butter pudding. The proceeds of this race go to the local school and the schoolchildren seemed to have got much more involved in the event this year. There were pictures on the wall, little cards on the tables saying 'Thank you for doing the Belvoir Challenge' and every race completion certificate was a different drawing completed by a child. A nice touch. 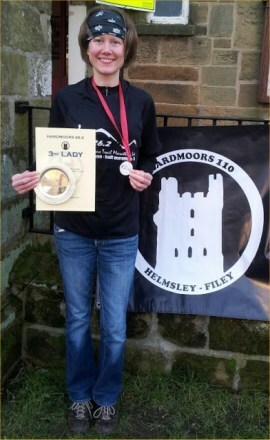 The Hardmoors Osmotherley Trail marathon was tough. Some big hills and quite a bit of mud and some snow. There was quite a climb out of Osmotherley, then the route undulated along trails across the moors to halfway. Then 3m over three big hills along the Cleveland Way from Lordstones cafe to just before Clay Bank. It took an hour. Then back to Lordstones via the lower path which was pretty muddy - that took me almost an hour as well. Then it was following the Cleveland Way back to Osmotherley. It started with a big climb up Carlton Bank and the a lovely descent to Scugdale and a long drag to the radio station and the descent into Osmotherley and the finish. There were some lovely views from some of these hills. It was a beautiful day to run. Sunny with only a bit of wind. It would have been much harder if the weather had not been so kind. It was a well organised event with a tee shirt and a medal for all finishers, plenty of well stocked checkpoints and a well marked course. There were three events being held on the same day - a marathon, half marathon and 10K and everyone seemed to enjoy the first running of this event. There are four more similar days in different places on the North York moors during the rest of the year. Aaron Gourley was also running the marathon but he finished so far ahead of me he had long gone by the time I finished. My time was just under 6hr 45min which is much longer than I normally take, but this one had lots of hills, so I wasn't disappointed with that time. Phil Owen did an excellent job at his checkpoint having carried all sorts of provisions up a big hill to reach his station. 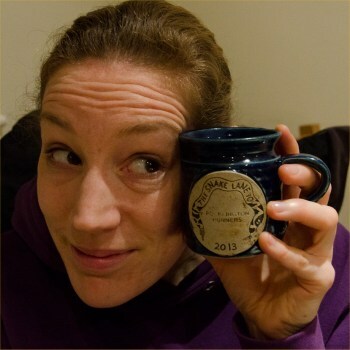 Melanie ran the half marathon and did very well and she has written a separate report. The only difficulty is that I finished with very bad blisters on my heels. I can't recall this happening before. 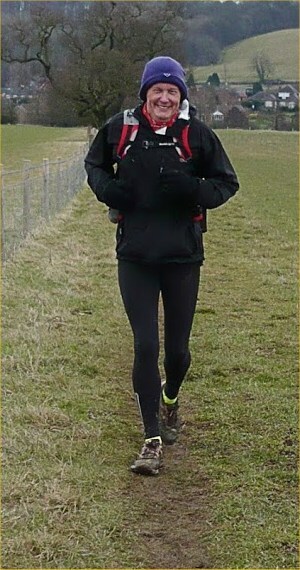 I used the same shoes for the Hardmoors 30 and they were fine there, so I am not sure what is going on. They had better heal fast ! It was nice being in Osmotherley as this is where I did my first ever marathon. However this time it was for a different event, the Hardmoors Half marathon, that had brought me back to this village. They were also offering a 10k and marathon option (you can probably guess which one Lisrun did). We picked our numbers up at the village hall, then at 9am I went outside to wave off those who were doing the full marathon. The half marathon started at 10am and begins with the first 1km on road. We then turned off on to the Cleveland way and the rest of the race was mainly on trails with a few pretty muddy sections and even bits of snow. I got to mile five where a marshal pointed out to me that I was currently the third lady, I knew there was still a fair bit to go yet but I hoped if I kept pushing myself I could maintain that position. The route then took us in down a one mile descent that zig zagged through Clain Wood, it was nice to actually be going downhill as up until this point I felt there had been quite a bit of up. As we came out of the woods it was the start of an out and back section and probably the hardest part of the course. After crossing the road it was just one long non stop ascent to Knolls End. The out and back section was useful to gauge where other runners were. I saw the first and second lady coming back down the hill and knew they were way ahead of me so there was no point in trying to catch them. I got to the top, turned around and made my way back down. I passed the fourth lady who must only have been about a minute behind me so I knew the pressure was on. I took advantage of the rocky downhill by throwing caution to the wind and descending as fast as I could hoping to increase the gap between us. It was then back through the edge of Clain Wood but this is where it then went a bit wrong. I was too busy talking to another runner and managed to miss the direction sign and took the wrong path. I ran down a hill and other runners were following me :O, I only realised it was the wrong way when I got to the bottom. I turned around (apologising to those that had followed) and went back up the hill, kicking myself for wasting time, energy and probably my position, it was a silly mistake but I guess I was getting pretty tired by now. At this point I had lost about three minutes and had no idea what position I was now in. Running most of the hills then the fast walk up Knolls End had really taken it out of me and by mile 10 all I wanted to do was walk. From then on I had to run/walk the hills, I didn't know if there was any point of pushing myself since I had probably lost third lady position, however the slim possibility that I hadn't kept me going. The last mile and a half were thankfully mainly downhill, I knew I was so close so put everything into the descent. I got to the village hall, they checked my position and I had come in third female :) I was over the moon. It was the first time Hardmoors had run this event, it was really good and we plan to do more in this series, it was well organised, the route well signed and manned checkpoints approx every two miles. Dave finished his marathon a bit later with some impressive blisters on his heels to show for it, ouch. The Compass Sport Cup & Trophy is the nearest thing in orienteering to what the Harrier League is to NE cross country. One key difference is that it is a national competition with regional qualification rounds; another is that, as some orienteering clubs are very small, the competition is divided into the Cup for big clubs and the Trophy for small clubs. My club, Northern Navigators, is a small club so at the weekend we competed against other small clubs in the north of England and southern Scotland for a place in the final of the Compass Sport Trophy. The two competitions take place simultaneously and this year were organised by NATO, the Tyneside orienteering club rather than the military alliance and a big club, and took place in Slaley Forest south of Hexham. There are several different classes depending on age and gender with upto two or three runners in each class counting towards an overall club score made up of the best 13 runners overall. Like the Harrier League those runners who aren't counters still help in pushing counters from other clubs into lower positions. Because of the scoring it's definitely an event for the club coming out in force, in breadth and depth. And on the day NN really did come out in force, fielding 20 competive runners. And what a day! It was bathed in glorious sunshine. Elfie dropped me in the middle of the forest near Ladycross Quarry where the event assembly was and my plan was to zip round the course and then jog back home for a late lunch. As I got out of the car I bumped into Dougie who reminded me that the start was getting on for a mile away. I was just about to head to the start with Dougie when I remembered I had to pick up a new club top. Although you don't have to run in club colours it's nice to show your colours on an occasion like this and so I headed to the car park to get a brand new top from the back of Boris's car. By the time I had jogged to the start and got changed there was only 10 minutes to go before my start time and Dougie was well into the woods already. Although it was dry from above it was anything but from below. Some of the tracks were positively clarty and even patches of dry-looking open ground turned out to be marshy. At one point I was almost up to my knees in mud. Great stuff! The navigation was fairly straightforward though I had a couple of misses and at one point struggled across a landscape of tree stumps and ditches when it would definitely have been easier to take a long route round a nice track. In many ways this really is cross country: ditches, mud, streams, mud, uneven ground, mud, hills, mud, nice tracks and even more mud - it was glorious! As I got to the last control seventy something minutes after starting I saw Dougie, and serveral others, looking for it. Maybe I was lucky but my line took me right into the control and then it was just a short track run to the finish. At the finish I realised how much punishment my nice brand new top had taken along with my nice new Craft thermal. I guess there was more gorse and scratchy trees than I had thought. After hanging around a minute or two for Dougie we walked back to his car via the assembly area to download our dibbers. By now it was a lot later than I had expected and so I wasn't going to make it home for a late lunch. Instead I took advantage of Dougie's Berlingo as an impromptu coffee shop and changing room. Since this was the largest gathering of our club for a good while I decided to hang around for a club photo. Herding orienteers is a bit like herding cats but eventually 20 of us managed to be in the same place at once and we got a photo. Then it was just the run home! From the edge of Slaley Forest I took the packhorse trail over the fell to Penny Pie and then down to Blanchland. By the time I got to Baybridge I decided to walk up the road rather than het knee-deep in mud again by using the footpath. In the end the run home was longer than the orienteering and I had definitely missed my lunch! The good news was that Northern Navigators had come second in Trophy round and had thus qualified for the final. A great achievement and I hope I will be able to make the final later in the year but I'm sure the club will be out in force vying to win the Compass Sport Trophy. Beautiful, sunny skies and temperatures above freezing with only a breeze made for near-perfect running conditions on Sunday, apart from the fact that underfoot all was entirely clarty, as the race title suggested!! Numbers depleted by the late drop outs, Mike B and Nigel H, a small band of Striders assembled outside the pub in Commondale village, rallied by Jan Y, led home by Will H, with Mike, David, Laura and Barbara also enjoying a largely runnable route across the moors, with fantastic panoramas if you took a moment to pause for the views and get the breath back ... which was essential after the uphill start. Despite the abundant clart the path was pretty easy to follow for us mere mortals, though at the sharp end the leading pack of 8 runners, including Will, missed a turn and headed for the next valley, finishing much further down the field than pace and form indicated, so for Will it was a disappointing start to the NE fells championships!! I saw this race promoted a lot online recently and quite fancied it, but thought as I probably did last year and the year before that I'd be better doing a longer slower run with a marathon in only a couple of months to do. In the end a bit of a knee tweak I've been carrying for a couple of weeks persuaded me to dial down the miles a bit and brought this back into my possibilities list. The race was started 5 years ago in memory of a former Billingham Marsh House Harriers member, Ann Johnson, who sadly died of leukaemia. Ann's husband, Barry and children set up the race in her memory. It was a beautiful morning and there were loads of people milling about in the sun, quite a few of whom I recognised and chatted to including several who'd started running regularly through parkrun and were now club members. I couldn't see any other Striders, although it would have been right up their street for many. The race starts at the top of a hill so from there there's only one way to go - downhill and fast, from there it circles round and through the country park before taking in the edges of fields and just before the end another bigger hill. In a lot of parts it was soggy and muddy underfoot, giving it more of a cross country feel than say a fell race, but it was all runnable and well signposted by cheery marshals. The final part is just over the brow of the first hill, a nice fast finish in front of cheering crowds and those runners who have already finished. I made it nearer 4 and a half miles rather than the advertised approx 5, but that was neither here nor there. There was nice bright yellow technical t-shirt, a bottle of water and a Mars bar for all finishers, Ann's daughter, Emma wrote elsewhere, "Mum's only excuse for a Mars bar was after a race! Never has chocolate tasted so good." A great fun race and great value at a tenner, and would have been even cheaper if I'd got myself organised and entered in advance. Strongly recommended. After seeing a video on YouTube over a year ago advertising a zombie run I got excited almost immediately. As a fan of the zombie genre I was eager to sign up but after clicking on the link I was disappointed to see that the run was in Baltimore in the US. Fast forward a year and my wife, Anita, emailed me from work to say that a colleague has spotted a zombie run in the North East, organised by Skulltopia Events. I again was very excited, until I saw the price: £38 for 5k. However, comparing this to events such as Tough Mudder and Men’s Health Survival of the Fittest this seems like the going rate. After a bit more research I found a note on Skulltopia Events’ Facebook page saying they were looking for volunteers to be zombies and in return you can have free entry to the next calendar event. I emailed straight away and started recruiting fellow zombies. I tried to sell it by getting them to think of it as a huge game of tig/tag, rather than flesh eating zombies and their prey. A few friends from my American Football team and Anita (somewhat against her wishes) and I all signed up. We arrived in Chopwell woods not really knowing what to expect and made our way to the make-up tent where we were "zombified" by Shades of Wray FX. After modifying our costumes, cutting them to pieces, we were taken to our positions. As there were less than the expected number of zombies turning up we had to quickly run from the first scare point to a second position before finally making our way to the end zombie gauntlet. As well as avoiding zombies the runners had a bit of hill running to take part in and obstacles, making sure they are nice and tired by the time they reach the zombie gauntlet. Our job, apart from trying to scare the runners, was to remove three tags from their belts. Once they lose all three lives they are 'infected'. They still complete the race but are no longer targets for the zombies. Right from the beginning there was a competitiveness amongst the zombies as to who can get the most lives and with three races throughout the day we had plenty of opportunities to attack our victims. We had the element of surprise and spent the day perfecting the best ambush spots and plans of how best to herd the runners into the path of fellow zombies. The day was a huge success and was even featured on Look North on Saturday evening with a longer piece being aired this coming Thursday as well as this piece online through Sky Tyne and Wear. Despite not looking forward to the day at all and thinking that the whole thing was silly, Anita had such a fun day that she has volunteered us to do it all again in two weeks time in Hamsterley forest. I can’t wait. Run for your lives! I closed my eyes, drew back the curtain, to see for certain, what I thought I knew. Yup, the weather was minging. I was just so not in the mood to do a fast flat PB hunter's 10K that I knew would be neither fast, nor a PB. I PB'd in 2011, then again in 2012. It wasn't going to be three in a row. This was the third year of the Mad Dog and its most ambitious yet. Larger field, more road closures, and some other stuff. The biggest change was the introduction of park and ride, or, park, queue and ride, to give it a more accurate description. It was bad luck that the weather was so cold and damp and the organisers discovered in the morning that the buses were not allowed to go the quick route from carpark to the start so the queues to get back after the race were long and shivery. In a neat bit of PR one of the marshals walked along the queue apologising for the delay, chatting to the maddogs, listening and getting feedback and promising to get the glitches sorted for next year. I wasn't too worried - we didn't have to wait too long - and Roberta and I were both veterans from the Edinburgh 2009 marathon where the shuttle buses were hopelessly inadequate. So a 20 minute wait for a bus was no big deal, and it's not as if you couldn't walk to the park and ride, and many did. It was probably only 20 minutes. Might do that next year. The park and ride delays meant the race started half-an-hour late. Bad news on a cold damp morning, but not that bad. Most of us just sat in the nice cosy school corridors of Stanley School sipping coffee and waited until it was time to go. The Crazy Pups had already started and now it was time for the Mad Dogs. Signs advised us that Pedigree dogs should assemble near the front, but I joined the Mongrels near the back. I sniggered guiltily at all the signs advising us to behave while off the lead and not to sniff other dogs bottoms. They've made a few subtle but clever course changes. More road closures and imaginative route choices make this race a rare beast; a fast PB road race that is also an interesting course. Along the promenade, past a Steel Band (that's new), and then the tell-tale sign that the race is really getting big. An Elvis. An Elvis singing "You ain't nothing but a houndog" to those in suitable fancy dress. The last 3 km rejoined the outward course around the Steel Band point so we got another blast from them (they were great) and a long fast finish which was the same point as the start. Even in its far larger form (1700+ finishers) there were still space to run. I didn't PB, but I was very happy with my 48:13 time, which was a lot faster than I expected, or deserved. It had been a good fast hard race and I love the excitement of running in a pack and still having space to overtake. But there was something missing. I showered, had a coffee, rumaged through my goodie bag, but something wasn't quite complete. Where was he? I had my photos from 2011 and 2012, and, aha - there he was! Now I have one from 2013 too! When Alister said this was a hilly half marathon I always believed it would be but what I didn’t realise is that it takes in some of the Spen 20 course which I ran in 2012 when I was at my fittest. Jill and I set off early on the Sunday morning (just in case we got lost on the way – I have a history of this as you all know and was the navigator) but we managed to find the parking and village hall straight away so had plenty of time to register and get ourselves as prepared as we could be (so no wins on your bets Alister and Bill). It was snowing quite heavily and I don’t think either of us were overly enthusiastic at this point. Anyway we set off at 11am in the snow well wrapped up with hats, gloves, coats, buffs and anything else we could find that we had taken with us. Within a couple of miles we were soaked through to the skin and I was thinking “that’s another stupid mess you have got us in to Susan!” At 5 and a half miles we hit a nice downhill section followed by about a mile of straight which whizzed past. There was then a lovely big hill at about half way which seemed to go on forever and I am sure that is where my legs started to feel very heavy. I kept saying to Jill go on and I will see you at the end but she refused and stayed with me whilst I must have moaned pretty much the rest of the way round! She did at one point threaten to sing to try and make me go faster but even Jill’s singing wouldn’t do it for me lol. At about 10 miles we passed a guy walking and Jill was really encouraging towards him. When he didn’t answer her and didn’t speak to me even though I said hello I managed to put a spurt on as I was not going to let him beat me – what a misery guts! Jill finished just before me and we were glad to get out of our wet clothes and head back for the car. We just couldn’t find the car though and wandered round Robertstown for a while before someone pointed us in the right direction. Then it was off for a well earned Sunday lunch and a drink. Jill says she quite enjoyed the run and would do it again. I can’t say I enjoyed much of it but knowing me I would do it again if persuaded in the pub. 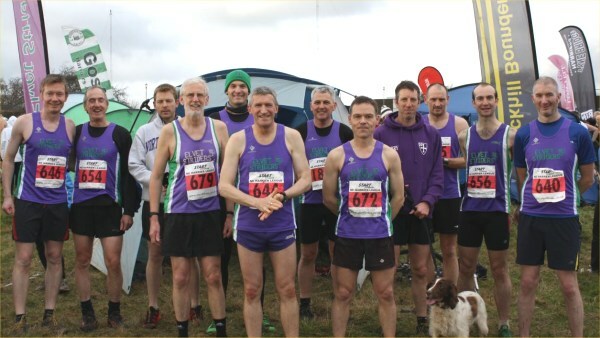 Striders Run Riot at Wrekenton! Saturday saw some fine runs by Striders, both new and old. Debutant Megan Bell finished as 2nd counter for the Women's team and was closely followed by the 'flying geologist' Rachael Bullock finishing as a counter for the first time and showing a very welcome return to form. 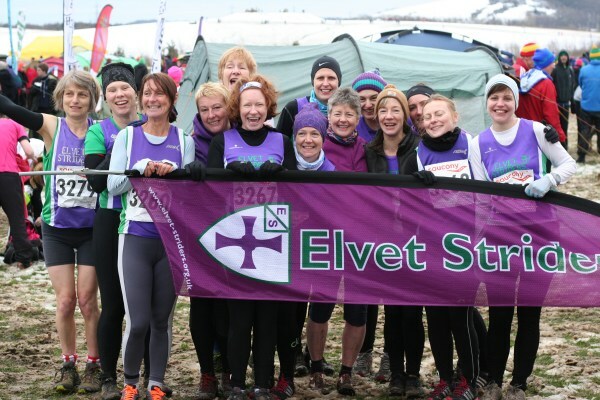 Evergreen Fiona Shenton led the strong women's team home with seven of the 13 ladies finishing within 1 minute of each other (including debutant Laura Garnham) - you could have chucked a blanket over them! Well done one and all for bringing the team home in 7th place - but our sleepless nights, worrying about relegation, are set to continue as it looks like we've been pulled back down into the 'red zone'! The Sea of Purple needs to have a storm surge at Alnwick and Prudhoe if we're to stay in the 'top flight' for next season! Let's see a few more gutsy performances like those of Barbara, Katy and Louise to help keep the purple flag flying high! The Men put in another solid performance with Will powering through from the medium pack and Tom edging ever closer to joining him there. Mike Hughes put in a fine debut on the undulating course and it was good to see Alan Smith and Stuart McConnell back in the mud where they belong! Although we had a good turnout there were a few regular faces absent from the tent and the cake fest afterwards. However, we weren't short of supporters with Mike Elliott preparing himself for the nationals, Jacquie (who came to watch Alister's green spikes sprint for the line), the Waltons there to cheer on Mum, Simon Gardner on camera duties, three dogs and 9 month old Archie Garland there with his Mum to watch Dad finish as a counter! With supporters like that we can't help but run our socks off!! It was a bit more of an effort than usual to get up to do this race. The Striders Christmas party the night before was not the ideal preparation ! This was termed a trail race although it felt much more like a parkrun. The route was entirely on tarmac paths in an attractive well maintained park with a lake, fountains and a bandstand. Apparently the location nearly was home to the Stockton parkrun which is now located at the Tees Barrage. There were 141 finishers with a number of familiar faces from the earlier races in the series. From the start at the bandstand there was a winding descent to the lake and then a flat section with a little ice before a moderate climb back to the higher level. Then round the outside of the park and back down to the lake. Two and three quarter laps in total before we headed back to the bandstand in the centre. Melanie and I weren't really in any state to go hard in this race, but we were pleased with times under 26min although later we realised the course was a little short of 5K. When I did the second event in this series, the goodie bag was very impressive. As the series has progressed the goodie bag has got smaller until it became non existent at this event but at £3 they are very cheap events ! It was a fairly mild morning in Durham when we set off - 4 of us: Jan, Barbara, Laura and myself (enough women for a team! Bit of a rarity apparently for fell races!). When we arrived at Clay bank and there was a decent covering of snow (and ice) on the ground, I realised how little I had thought this through - of course the high ground in the North York Moors was going to be colder than Durham city centre - and I felt a little under-dressed. But not to worry, I soon warmed up nicely once we started running and maybe it was even an incentive to run faster. There were knee-deep snow drifts in some places, but snow was not covering the ground everywhere; where there wasn't snow there was plenty of mud! There were also some track and paved sections, so there were some nice breaks in the tough terrain and decent chances to stretch your legs out. And whilst the ascents are always hard work, they were nicely spaced out and not super-steep so they were perfectly manageable. It did, however, feel like the longest 7.5 km (or was it 8.5 km? anyone's guess ...) I've ever run. But very enjoyable indeed and nice views. It turned out to be a fairly eventful race ... Barbara got lost (standard), but managed to find the rest of the runners and finished well (even if she managed to miss out part of the route ... cunning!) Laura, in her debut race for the club, also got a little bit lost, but managed to cling onto other lost runners through swamp and all to return safely. Dave's shoe fell apart so he did excellently considering! And the highlight? I beat Shaun - which I think we can safely say was due to his drinking and dancing antics at the Christmas party the night before, but still, I'll claim it as a victory - thanks Shaun, it made my day! Having, for many years, been an avid lover of cycling and running I was persuaded by a friend to have a go at a triathlon. The idea of a new challenge which involved running and cycling over distances my ever aging limbs could cope with seemed like a good idea, only one problem I thought, I can’t swim! Only one thing for it then my encouraging wife said to me, “Learn to swim young man”. Not having the first idea of where to begin I was pointed in the direction of Durham Tri Club’s swimming coaching sessions at Freeman’s Quay on a Saturday afternoons. “They’re a friendly bunch with a lot of experience” I was told, they’ll need it I thought to myself. So off I went for my first swimming lesson since leaving junior school. As I stood poolside on my first afternoon I thought to myself “what on earth are you doing here” as I watched the regular swimmers go through their warm up sessions, gliding through the water faster that I could run. As I watched in awe, one of the coaches introduced himself and asked me to get into the water and do a 300 meter warm-up so he could assess my technique and ability level. By the time I’d finished laughing I think he’d got the idea that I was a complete novice at this swimming thing. I thought the idea of teaching someone with little or no ability was a lot less appealing than honing the skills of already accomplished swimmers and with that I would be left to splash around in the water like a bunch of school kids during their summer holidays. I couldn’t have been more wrong, along with 3 other beginners we were put in a lane of our own and treat to a session of almost one to one coaching, after an hour the swimming bug had bitten. A few months later and 5 swimming lessons under my trunks I was emailed a poster advertising Durham Tri Clubs “try a tri” taster sessions, five, two hour, sessions giving you an insight into the varied disciplines of a triathlon. On Saturday 2 February I turned up at Freeman’s Quay for the first session, swim, run and core technique. Having been a runner for a number of years now and attended circuit-training classes regularly, I thought the core technique and run skills lessons would prove to be straight forward, I was looking forward to learning most from the swimming class. As the afternoon progressed my initial thoughts were proven to be wrong. As we stood in the car park round the back of the pool we were told by our coach “I’m now going to teach you how to run properly and more efficiently”. After a little warm up we started with arm technique, which was quickly followed by stride technique and upper body posture. After half an hour of practice I had learned how to increase my stride length and speed, getting me across the car park in a third of the time with a lot less effort. Core technique turned out to the same, I always thought that a little bit of cross-training helped to give the body a rest from the rigours of running and cycling whilst at the same time increasing fitness. I now know that core stability not only assists with making the body more efficient by improving quality of movement but also helps reduce injury by supporting the back and improving coordination of movement. All in all the first “try a Tri” session has turned out to be a valuable experience. Learning new skills in the disciplines I thought I was already accomplished in and finding out how to train my body to be more efficient and less prone to injury has fuelled my thirst for the four remaining sessions. To make things better the coaches are a friendly group of knowledgeable people with a real interest in helping you get the best out of your training whilst at the same time making it an enjoyable, if painful, experience. If you’ve considered turning up but thought it might be more of what you already do think again, “try a tri” and you might just be surprised at what you could learn.